The Shire of Katanning operates the largest undercover sheep selling complex in the southern hemisphere. Sales are held every Wednesday and at other times by special arrangement. Come and enjoy watching the 'truckers' and sheep dogs unload the sheep on a Tuesday afternoon before enjoying dinner at the cafe or enjoy breakfast before or after the auction at 8.30am every Wednesday morning. Visitors should ensure they wear enclosed shoes when entering the saleyards. Officially opened by the premier Colin Barnett, on the 28th May 2014, the Saleyards houses 1008 selling pens under a roof of more than 44000sqm and is the only saleyards in Australia with water in the selling pens, and is capable of trading 1.5 million sheep annually. The Shire of Katanning received funding as part of the sale of Midland Saleyards. $17.5 million was contributed from the State Government and then applications were made to the Federal Government Regional Infrastructure Fund where another $7.4 million was received. Early quotes from government agencies to build the facility were costed at $44 million. This figure was beyond the estimated budget the local Shire of Katanning Council could raise, therefore putting the project out of reach. The Shire of Katanning decided to appoint a Project Manager from their own staff and employ local builders and tradesmen to ensure the cost was contained to within budget forecasts. The Shire of Katanning hired two local builders, local electrician, local IT technician, Plumber, Engineering Manager from Albany, draftsman from Albany and up to 38 local staff during the build in a series of different jobs on site. Local stakeholders contributed to the design of the Saleyards after visiting a number of recently completed Saleyards in the Eastern states to ensure the most modern and innovative design was available to the draftsman. It took approximately 2 years from start of design planning to opening day. The final cost of the project was $26 million. The additional Federal Government money enabled us to finish the entire project, which includes 9 sheds, 8 drafting facilities, the equivalent of 1000 selling pens and 18 loading ramps. The roof covers 4.2 hectares (10.4 acres) and the tarmac area covers 6 hectares (15 acres). The water from the roof is collected in 6 tanks (1.5 million litres). This water is used as drinking water for stock, truck washing and treated for canteen use. The tarmac water is collected in dams (54 megalitres) and in the future will be pumped into the upgraded town lake for recreational use. There is a 4.2 kilowatt solar farm on the roof of the canteen which provides for use over one day and then 6 days of production are put back into the grid. There is no revenue received from this as it is an industrial site. The new Saleyards facility was completed, and officially opened by the Premier of Western Australia Colin Barnett, on 28 May 2014. Trade sales are held every Wednesday. Preparation for the weekly sale begins on a Tuesday at 12.00pm until the evening at 8.00pm and then continues on the Wednesday at 5.00am to 8.00am before the sale begins at 8.30am. There are 6 – 8 special sales held over the year- mostly on a Friday. As there is less drafting at these sales, the lines remain larger so the capacity would be up to 40,000 in one sale. The facility has the ability to yard 26,000 sheep in one sale. With larger sales, the process begins again and a second sale is held on the same day- taking the daily stock yarded to 40,000. 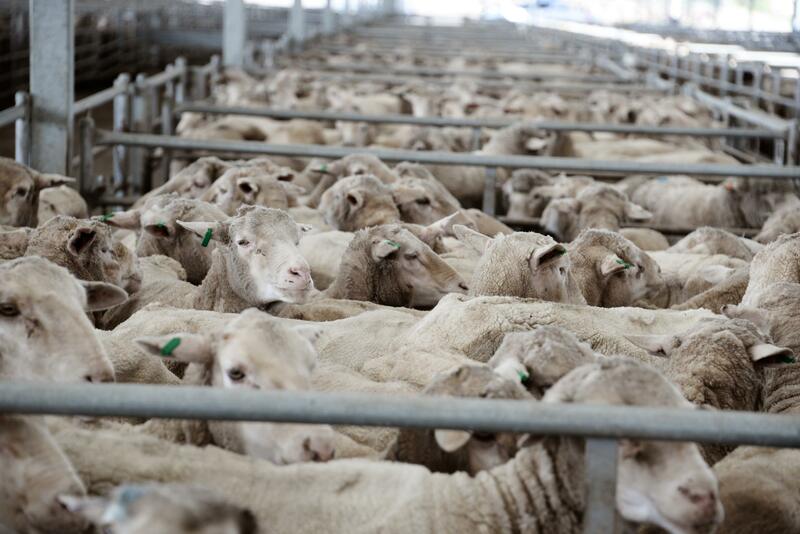 For the last 40 years, the Katanning Saleyards have averaged 20,000 sheep per week or 800,000 to 1.3 million per year. In recent times, an average yarding is approximately 12,000 to 15,000 due to the downturn in stock numbers statewide. There are approximately 10 regular buyers every week with another 10 buyers irregularly attending. There are around 20 stock staff used to prepare the sheep for sale. 4 auctioneers and 10 administration staff are used to process the sale documentation. The processing is very precise as each animal must be able to be traced for its lifetime. The cost, to the producer, of selling each sheep is: 80 cents, this includes a fee to the Katanning Shire and 5% of the price to the selling agent. The sale is made up of 30% crossbred lambs (mostly meat breeds), 20% Merino lambs and the majority of the remainder being old mutton. The crossbred lambs are bought by meat processors for local consumption and export. If they do not meet the required standard, feed lotters buy them to bring them up to the correct weight. The merino lambs (up to 12 months old) are bought by graziers to use on their own property. The mutton is almost entirely bought by export processors for sale overseas. Approximately 60% of every yarding is sold to processors for slaughter with the remaining 40% being returned to farms or feed lots. Transporters are a large part of the industry and there would be approximately 30 employees from this industry. There are stockmen to remove stock from yards, drivers of the trucks that carry up 700 head per vehicle and administration staff coordinating the transport.